Our modern, purpose built funeral home allows us to serve families across the local areas of Tintagel, Camelford, Delabole, Rock, Port Isaac, Wadebridge, St. Issey, St. Merryn, Trevone, Treyarnon Bay, Constantine Bay and Padstow with the reassurance that our premises & our service standards surpass the National Association of Funeral Directors compliance inspection. We have easy access from the main road through the Link road car park to our Chapel of Rest which is private and secluded within its own grounds. Offering plenty of car parking, families have somewhere that they can come and pay their respects to loved ones, and all within walking distance of Padstow Harbour. T. C. Rogers & Son pride themselves on supplying you with a first class service who are the only four generation experienced family business for over a 100 years in North Cornwall, and as part of this commitment we believe it is only right that we invest in high quality vehicles for the luxury & comfort to the families we care for, with our own fleet of Mercedes vehicles, which are kept in immaculate condition, but keeping the cost affordable. Can I afford to pay for a quality funeral service? Yes you can. We can confirm our prices are a lot, lot lower than £ 4,000 & you will still receive a quality service. So give us a call on PADSTOW 01841 532463 or WADEBRIDGE 01208 820009. We do not ask for any payments upfront like some firms do! 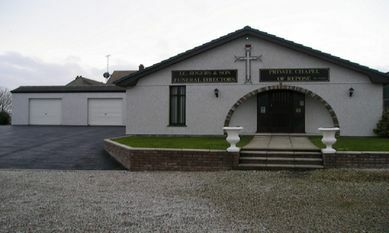 We also offer package funerals and a very basic cost budget funeral. Just explain to us your needs or budget and we will help, handle and advise on any grants that may be available. You will be pleasantly surprised at the help you could receive and we will of course help you fill out the forms for you to claim these grants. Please don't be afraid to talk to us and we will do our best to help. It is a lot less than you think!! T. C. Rogers & Son provide a 24-hour service for the deceased to be taken into our care from their home, hospital or from any residential or nursing home. Whether the wishes are to be a burial or cremation, religious or non-religious services, we arrange newspaper notices, music CD's, orders of service, collection of the chosen donations, we advise you on registration of the death and more. In addition, we can also supply alternative transport for your loved one by motorcycle hearse or horse-drawn carriage on the day of their service.